I am trying to use soatest Extension tool with maven. So i added the dependency in the maven and now I try to load that class in the Extension tool,. However I am not able to. I am loading the class but then also I am not able to see the .methods in the dropdown. For the purposes of Extension Tools or scripting, SOAtest has no knowledge of Maven repos. You will need to add the jars to your system properties as described in the forum post referenced by @Ireneusz Szmigiel. The easiest way to do this would be to copy the jars into the /TestAssets/system_jars folder, although specifying the system.properties.classpath will work too. Keep in mind that you need to be very careful with the path syntax when specifying the system.properties.classpath. Based on the jar you are referencing, it appears that you might be trying to run a Selenium script from inside SOAtest. Note that the Parasoft marketplace has a Selenium runner tool that is able to run Selenium scripts from SOAtest easily. You may want to check it out. 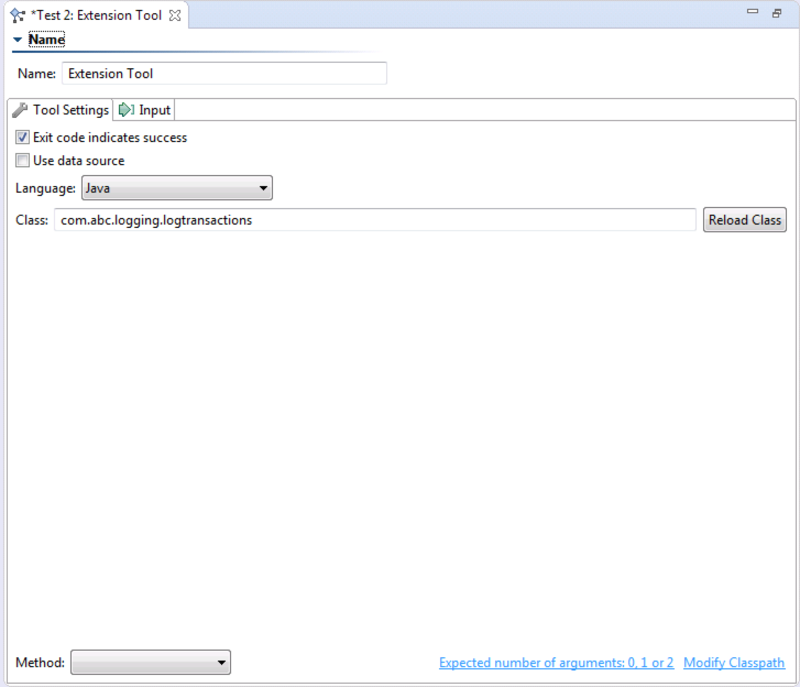 but still I am not able to see the methods of the class in the Extension Tool. Can you try copying the jars to the system_jars folder just to see if that will work? You may want to consider contacting Parasoft support since it's not clear what you are doing wrong. Correct - as I mentioned previously, SOAtest itself is not aware of the Maven dependencies. So you need to connect it to the jars via one of the other suggested mechanisms. The 2nd way is to add it to system_jars. So I have a project in java perspective, under that you want me to add the folder system_jars and then add the jars from the maven dependencies. Am I following it correctly? This forums post explains how to do it - add a "TestAssets" project to your SOAtest workspace. Then add a directory within that project called "system_jars" and copy the jars into that location. Restart SOAtest and then try it. I am not able to resolve this. Could you please describe what you did?Which approach you have used? We need more details to be able to help you? Do you still see the same error? Do you have it working in SOAtest? If yes, what happens if you are trying to use the same workspace in maven? executed by the same user as GUI? If you can not share details on forum, please contact Parasoft Support Team. I am using 9.10 version of soatest. I have created a maven project with soatest. Now when I am executing a plain soatest , it is working fine. But now I want to use Soatest Extension tool. Then I am trying to load a class which is added in the maven dependency, but while doing so, the methods of the class are not getting populated in the dropdown. as @jakubiak mentioned, SOAtest is not aware about maven dependencies. 1.Do you use the same workspace in maven as in SOAtest GUI ? 2.As you are using v9.10 then system_jars should work for you. Did you try approach suggested by @jakubiak? 3.As such jar has been created by maven, are you sure that you have it in system_jars directory before you are starting SAOtest task? 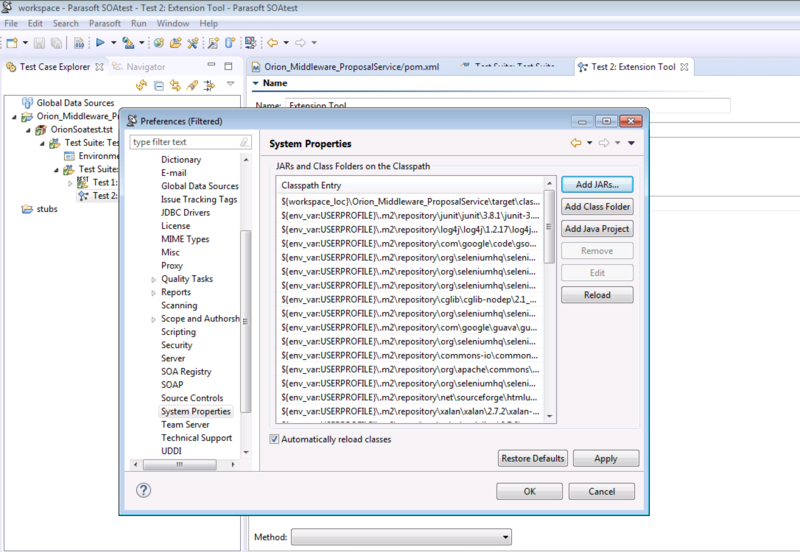 4.Can you publish in this thread localsettings.properies file used by you in SOAtest task? Yes both the workspace is same.